At Dean Trust Ardwick our expectations of attendance are very high, as we know that pupils can only achieve if they are in school. It is parents’ and carers’ responsibility to ensure their child attends school regularly and arrives on time. ‘A parent commits an offence if they fail to ensure their child’s regular attendance at a school where the child is registered’. Once a pupil’s attendance falls below 98%, it then becomes a concern to us and we start to monitor their attendance closely. We support parents and carers by following a number of stages to help remedy the problem. The issue is escalated following any further absences after the phone call alert. 1st stage of absence at 100% – 98% attendance- A text will be sent to the parent/carer. In the event of no response a telephone call may be sent in addition. This absence will remain unauthorised until the parent has spoken to school. 2nd stage of absence at 97.9% – 95% attendance- A letter will be sent home to invite parent/carer in to school to meet with their child’s Pupil support manager to discuss ways in which we can support you to help increase attendance and prevent further absences. At this stage absence may not be authorised without medical evidence. 3rd Stage of absence at 94.9% – 92% attendance- A further letter will be sent home to invite parent /care in to school to meet with their child’s Head of Year, at this stage an attendance contract will be drawn up and the parents may face statutory action. All absence will be unauthorised without medical evidence. Final Stage – 91.9% attendance and below – Legal Action is likely to be requested from the Local Authority for the unauthorised absence of your child from school. The Attendance Officer will invite parent /carer in to school to discuss this. In addition to the above an Attendance Officer may make a home visit to your address to discuss any attendance concerns. On the 3rd day of any continuous absence, regardless of reason, a safeguarding visit will take place to see the child who is absent. There may the exceptional occasion where your child is ill and there is no alternative but to stay at home to ensure a speedy recovery. We would expect you will take your child to the doctor in such cases. Please note that absence from school will likely follow with a home visit from us. In all cases of absence, a phone call to inform us, or an absence note is required. (There is a page in the pupils’ planner for the note). The Headteacher reserves the right not to authorise absences if the reason is not deemed acceptable. Please do not make doctors and other medical appointments during the school day (unless it is a hospital appointment and you have been give the date and time). Parents and carers should consider very carefully if their child is too ill to come into school. Telephone the school as soon as possible after 8am and before 8.30am with an explanation of the absence. Telephone the school or write a note for the Form Tutor to explain the reason for absence once back in school. Notify the parent / carer via text shortly after the register closes at 9.10am if no reason has been given for an absence. Ring the parent/ carer during the day if the school receives no reason for absence after 10am. Make a home visit on the second day of absence if the school is not fully satisfied with the reason for absence. Mark the pupil’s absence as unauthorised if the reason for absence is unsatisfactory, or after three days if no reason has been provided. Appointments for medical purposes other than hospital appointments should be made outside of school hours. Evidence of the appointment should be provided in order to authorise the absence. Pupils should not be taken out of school during the school day for any other reasons unless permission has been granted by the Headteacher from a written request by parent/ carer. The Education (Pupil Registration) (England) (Amendment) Regulations 2013 specify that Headteachers may not grant any leave of absence to pupils during term time unless they consider there to be ‘exceptional circumstances’. If a Headteacher grants leave, he or she should determine the number of days the child can be away from school. There is no entitlement for parents to take their child on holiday during term time. Parents can be fined for taking your child on holiday during term time without consent from the school. Absence during term time should be avoided because children can fall behind with their work and may find it difficult to integrate. An application for leave must be made in writing to the school, detailing the exceptional circumstances. (Please find Absence Request form on the website or collect one from school reception). The Headteacher must be satisfied the circumstances warrant the granting of leave. Medical appointments (parents/carers should be encouraged to arrange non-urgent medical appointments outside of school hours when possible). If the medical appointment is during the school day, evidence must be provided. Schools should not authorise a whole days absence for a medical appointment that occurs in the morning – the child would be expected to return to school in the afternoon, and vice versa. Pupils are registered for their morning session at 8.40am and the afternoon session at 1.20pm. 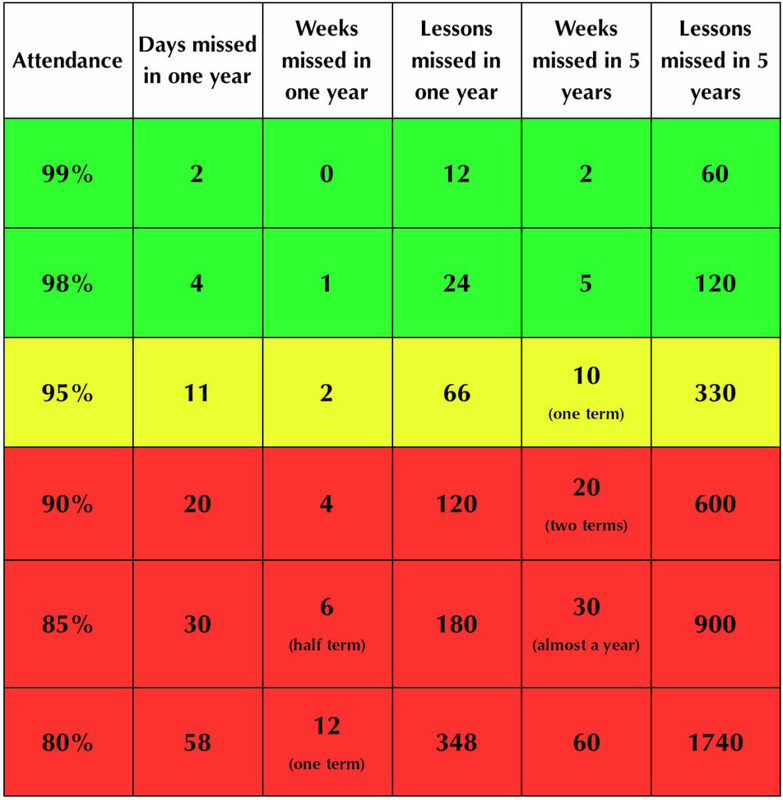 Pupils will receive a lesson attendance mark for every lesson. The decision of whether or not to issue a Fixed Penalty Notices is made by the Headteacher. The Local Authority issues the FPN and payment is made to the Local Authority. Parents/ carers will receive a letter from the school alerting parents to the possibility of a FPN being issued if attendance does not improve and a further letter will be sent if necessary notifying them of the Headteacher’s decision to issue a FPN. 10 or more unauthorised sessions of absence (5 school days) within a rolling academic year. One-off instances of irregular attendance such as holidays taken in term time without permission. Where an excluded pupil is found in a public place during school hours. The Fixed Penalty Notice fine is currently £60 per parent if payment is made within 21 days, and £120 per parent after this date. If it appears to the Local Authority that a pupil is not receiving a suitable education, either by regular attendance at school or otherwise, then they must begin procedures for issuing a School Attendance Order. The order will require the child’s parents to register their child at a named school. If they fail to comply with the order the parent can be prosecuted. The parent may be guilty of an offence if they fail to send their child to school regularly or if they fail to comply with a School Attendance Order. Local authorities have the power to prosecute parents who fail to comply with a school attendance order (section 443 of the Education Act 1996) or fail to ensure their child’s regular attendance at a school (section 444 of the Education Act 1996)6. Only local authorities can prosecute parents and they must fund all associated costs. The Local Authority must consider applying for an Education Supervision Order (ESO) before prosecuting parents. A local authority may apply for an ESO instead of or as well as prosecuting parents. The order is placed on the child and the local authority is appointed by the court to supervise that child’s education, either at a school, or at home for a specified period of time. A statement by the Local Authority or governing body agreeing to provide support to the parents for the purpose of complying with the contract. Parenting contracts are voluntary but any non-compliance should be recorded by the school or Local Authority as it may be used as evidence in court where an application is made for a behaviour parenting order. Parenting Orders are imposed by the court and the parents’ agreement is not required before an order is made. Parenting orders are available as an ‘ancillary order’ following a successful prosecution by the local authority for irregular attendance or breach of a school attendance order. A requirement for parents to comply with such requirements as is specified in the order. This element can last up to 12 months. All parenting orders must be supervised by a ‘responsible officer’ from the school (behaviour orders only) or local authority. They are individually named in the parenting order. Any breach by parents without a reasonable excuse could lead to a fine of up to £1,000. The police may enforce any breach of an order by a parent. Parents have a right to appeal a parenting order to the Crown Court. Where a pupil has not returned to school for ten days after an authorised absence or is absent from school without authorisation for twenty consecutive school days, the pupil can be removed from the admission register when the school and the Local Authority have failed, after jointly making reasonable enquiries, to establish the whereabouts of the pupil. This only applies if the school does not have reasonable grounds to believe that the pupil is unable to attend because of sickness or unavoidable cause. It is a well-known fact that the better the attendance, the more likely pupils will gain good GCSEs. The table shows that pupils who miss school regularly have much less chance of gaining good GCSEs, as they will fall behind due to the number of lessons they miss.